Gouramis refer to a group of freshwater fishes that together make the family Osphronemidae. This family of fishes is commonly found in Pakistan, Asia, India, Korea and the Malay Archipelago. 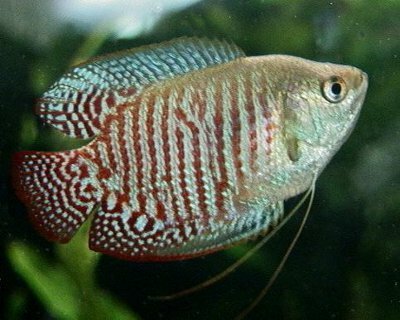 In the island of Java, the name gourami is also used for fishes from the Anabantidae and Helostomatidae families. At the front of each pelvic fin, the gouramis have an elongated ray which looks like a feeler. Many of the species in this family show lots of family care and compassion. The Siamese fighting fish for instance builds bubble nests. In this family, researchers have been able to indentify over 90 species which have been categorized in four sub-families and further grouped into about 15 genera. Some people also use the name Polyacanthidae to refer to this family. Gouramis have a labyrinth organ shaped like a lung that enables them to use atmospheric oxygen and gulp air. This organ is specifically useful for members of the family that frequent shallow, warm and poorly-oxygenated waters. In some parts of the world, the Osphronemus goramy are a delicacy. For instance in Indonesia, this fish type is usually deep fried and served with sauce. The dwarf and the three spot are among the gouramis that are often kept in aquaria. While in the aquaria, they prefer swimming near the top section of the tank. They also love warm waters just like any other tropical fish. Some of the species that can coexist peacefully with the gouramis include mollies,danios, plecostomus catfish and silver dollars.